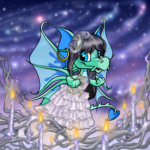 More than any other color of converted pet, fruit Chias are the most difficult to customize. Baby, Mutant, and Maraquan pets have limited options for wearables but all of these pets also have color-specific wearables. The only non trinket, background or background item wearable available to a fruit Chia is the Super Pea Chia Cape. Unfortunately for all other Chia colors, this cape is wearable only by the Pea Chia. The way a Pea Chia may obtain the cape is a complete mystery. May have been spotted around Avatar Chat, but the exact place they can be obtained is hidden to all. Rumor has it, a great deed involving dizzying heights is needed to be granted access to a cape. That's well and fine for the ever popular Pea Chia, but what of the other colors and what if a Pea doesn't want to fly? I've compiled a list of ten backgrounds (both neopoint and NeoCash) suitable for these friendly fruit. This background has merit if you want to place your fruit Chia in the middle of other colorful fruit. It also has the added bonus of being festive around the Negg Festival. Perhaps your Chia wants to stand in the center of a bunch of un-responsive vegetables and quote at them: Friends, edibles, countrymen - lend me your ears er... leaves. Perhaps that isn't the best speech for a fruit Chia after all. At least no corn was offended. This background seems to be a favorite of Pea Chia owners. The colors go well with the Pea Chia and matches the Lemon, Lime, and Orange Chia perfectly. What fruit wouldn't want to be displayed in front of a colorful explosion of their fruity kin? On second thought, perhaps that isn't the best background, either. Every fruit needs water to grow! This background makes sure your fruit Chia will get plenty of water so they grow big and strong. While the other most important thing for a fruit Chia (sun) is clearly missing from the background, you could always alternate depending on your Chia's needs or even your mood! You'll also be doing the Grey Day the benefit of a very happy Chia to cheer it up. Fruit Chia are some of the most cheerful pets in Neopia and their bright smiles are infectious. The Grey Day won't be grey for long with a fruit Chia inhabiting it! This background comes with the description "Be certain fruit does not have eyes before consuming." It is obvious this background was designed with fruit Chias in mind. Your Chia does need to be careful if set in the cornucopia and be ready to cry if anyone comes around for a nibble. Unfortunately for fruit Chias, this is actually a very important thing for them to learn! Besides the ever-present danger for all Chias of becoming a Lupe snack, Fruit Chias look like a delicious snack for many different petpets and a few herbivore Neopets as well. This background will make any Fruit Chia feel like one of the bunch! If you look closely (and maybe squint a bit) you may be able to spot another fruit Chia in the pile, or a fruit which a fruit Chia is based on. It's still a dangerous background for a Chia not accustomed to yelling when in danger, though. This background gives your Chia the best chance to hide around food without being eaten. Simply looking at this background can make a lot of pets queasy. You'll have no worries about hungry rampaging petpets looking for a fruit Chia snack or even Lupes coming to get your Chia on this background. As an added bonus, Alien Aishas are the only ones known for eating gross food and no fruit Chia is a gross food! This brings any danger of being eaten down to almost nothing while still wearing a food-oriented background. These background are grouped together because they all show gardens and are my personal favorites. A fruit Chia should feel most at home in a garden or otherwise outside in the sunshine. All of these backgrounds can easily be accessorized with Chocolate Chia Gnome, Faerie Chia Gnome, Gnome Wobble Toy or even the Lucky Slorg Gnome! The Faerieland Garden Background is a (free!) alternative to these backgrounds if you redeemed Burger King codes. This is the perfect background if you have an Apple Chia, but I'm sure any fruit Chia would happily go on these fruity adventures. The background is alive with movement from dancing apples hanging on ropes to apple bobbing in a barrel of water. Clearly, this is the background for a fruit that likes to party. With so many games, how could any fruit not enjoy themselves? In the same vein as the other garden backgrounds, this background places your fruit Chia on a farm. The wind is blowing the grass in a lovely pattern and one can only imagine how happy a fruit Chia would be to be out on this lovely day. The sun shines brightly on any Neopet standing in this most peaceful part of the farm soaking up the rays. The area is clearly remote, so your Chia should feel quite safe here. This lovely background will showcase your fruit Chia among other fruit. They'll be sure to enjoy themselves still in the cool, outdoor autumn air but are still at risk of being picked up as a snack! Use caution when using this background, but do use it. This background is the most commonly chosen background for fruit Chias. While it is a lovely background that places your Chia in the midst of other fruit, it is an indoors background. This lessens the chance your Chia could be mistakenly eaten as a snack but does inhibit growth as your Chia gets neither water nor sunlight. Many Chias placed in this background develop the tendency to strike a dramatic pose when people look at them, as they like to pretend they are posing for a still-life. Unfortunately there is a full course in Neoschool on the history of fruit bowl still lives so anticipate this to be the case for a long time. This concludes our presentation of possible fruit Chia backgrounds. Happy customizing - and never forget the usefulness of a background when designing a customization or building your character! It's usually best to put your Neopet somewhere they feel comfortable, unless your story calls for the opposite!